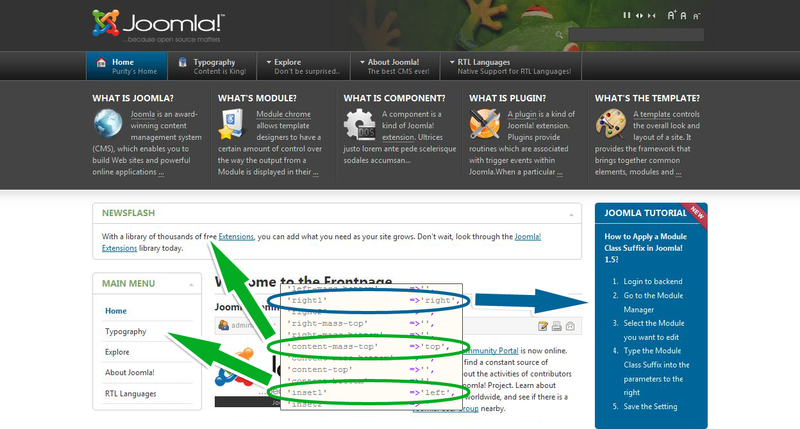 In this section Joomla! developers can explore and understand the new T3 Framework. 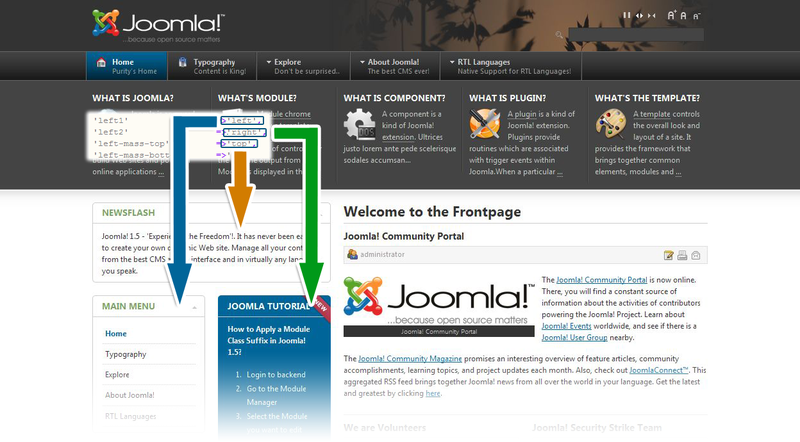 It will also demonstrate the T3 features that can be used by the Joomla! Community and all users navigating the World Wide Web. We will also go deeper into the framework and explain the structure, the blocks & layouts and the administration panel. A good start in understanding how all of these are possible is to understand the new structure of the T3 framework. This is the key difference and value that comes with the new T3 framework. We are going to dig into the structure of the T3 framework and explain why this incredible flexibility and power. The images below highlight the changes in the T3 framework file and folder structure. The new structure include two new folders called layouts and libs. Here you will find the default JA Purity II layouts, default blocks, default navigation tools (JA Menus) and default user tools. the user-tools block holds some of the controllers you use to make your website friendly to the user. This block holds the color switcher, the font switcher, the layout switcher, the reset settings controller, the screen size switcher and the navigation switcher. Now we need to understand the names of the block variations. By default, left block is squared and right block is rounded. The layout variations you are going to see below, present also left as rounded, and right as squared. The new block variations have distinct names so you can easily follow: left-rounded.php and right-xhtml.php. Notice: Please note that all files in the layouts folder have example names. You can use your own file names to suit your design purpose, as long as you will link them properly. Moving forward with our presentation, we will explain how the blocks are connected and form layouts. The left side of the image below shows the default JA Purity II layouts and the right side shows the blocks used by the layouts. Notice: Please note that the main block is included in all layouts, excluding the handheld and iphone special layouts that have their own special blocks resided in special folders. As you can see in the picture above, we have a special layout design just in case you want to advise your users to upgrade their browser client (yes, good old IE6). This layout uses his own blocks and his own stylesheet. default-joomla.php uses it's own blocks set, in the blocks/joomla folder, with minor module position changes to meet default Joomla! sample data. This is the default layout you can see online in the demo website following this link. The arrows and the piece of code from the default.php file suggest the block positions of the default layout. The default layout uses left.php block (as the squared style block in the left side of the layout) and right.php block (as the rounded style block in the right side of the layout). For this example we will have a closer look and explain the default.php file. This value is the percent unit used on automatically calculation of the columns width used in the layout, so in this case the main, left and right blocks have a column "behaviour". This part of code is the block position configuration of the default.php layout. The left block position has two subunits: left1 and left2. left1 is used by left.php block and right1 is used by right.php block. We will have a closer look at this block in the next chapters. Notice: Please note that moving left.php to left2 and right.php to right2 will not necessarily change the look. The look can change when modules use different class suffixes, and those classes have no or different styling. 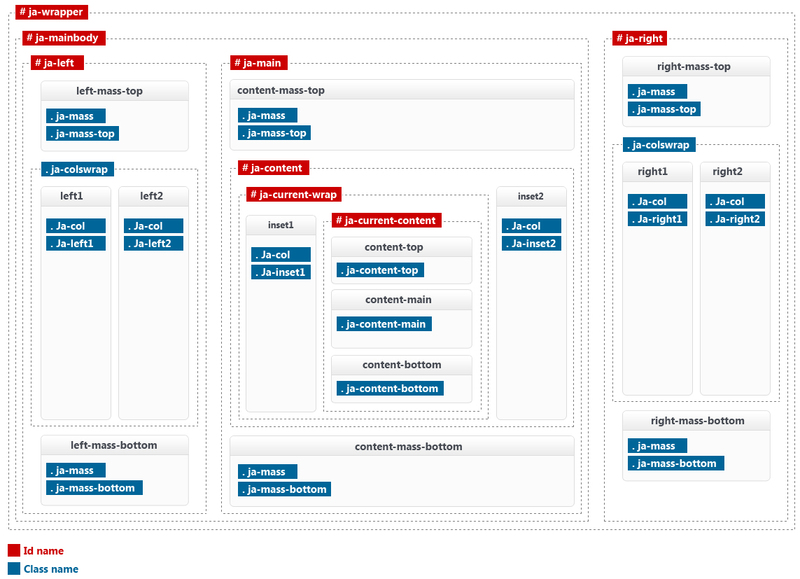 content-top and content-bottom, inset1 and inset2 are dumy module position you can use to assign modules to, and place them easily into the layout. This code is responsible of setting the default font size of the layout according to the backend settings. This code loads the header.php block, the mainnav.php block and the topsl.php (top spotlight) block that are used in all layout varitiaons of the JA Purity II template. This code loads the main.php block, the left.php block and the right.php block. By now you should understand why we used a bold font for the file names and how the layouts are formed. The layout variations you are about to see mostly have different styles and positions for these blocks, but you are free to do any variation you have in mind. This code loads the botsl.php (bottom spotlight) block, the footer.php block, the system debug, and the IE6warning block. The default layout has five layout variations. As PHP files, they are very simiar, but have small configuration differences that makes them look different. File left-main-right.round.php is responsable of displaying one of the five layout variations of JA Purity II. This layout uses an additional position for "newsflash", a module that is assigned to a virtual or synthetic "top" module position and it is set in our layout to use content-mass-top block position. The other blocks used are left-rounded.php block and right.php block. File left-main-right.square.php is similar to the example above, but this layout has a different style class. All module in all block positions have a squared style class, so left.php, right-xhtml.php and newsflash module using xhtml class suffix. File left-right-main.round.php is configured to have all rounded blocks, both left-rounded.php and right.php are set to the left block position. left-rounded.php block uses left1 block position and right.php block uses left2 block position. "Newsflash" module is now using left-mass-top block position. As you already figured out, the file left-right-main.square.php should look similar to the one above, but loads the squared class blocks, and the file main-right-left.round.php is similar to left-right-main.round.php but this time the left-rounded.php block is set to the right1 block position and the right.php block is set to right2 block position and the newsflash module is set to content-mass-top block position. Both mobile ready layouts use their own blocks and their own stylesheets located in dedicated special folders. The scripts powering the framework will detect the mobile device and will load the proper layout. You can always check these two for yourself with your phone online in the JA Purity II demo page. You have seen layouts loading blocks or module positions and blocks loading module positions, so what is now the index.php file for? Classic templates used to have all module positions inside index.php file, all script and CSS file calls, globals, template settings and other controllers, but now, everything got modular with the new T3 framework and the index.php file is only for layout and main parameters control, like a main router of all of the framework's script platforms. The new T3 framework design is developed to help developers in the process of building simple or complex, smart, clean and creative designs, and all of this is possible because of the ingenious modular structure. In this section we are going to explain how to manage the template parameters in the backend of your website. 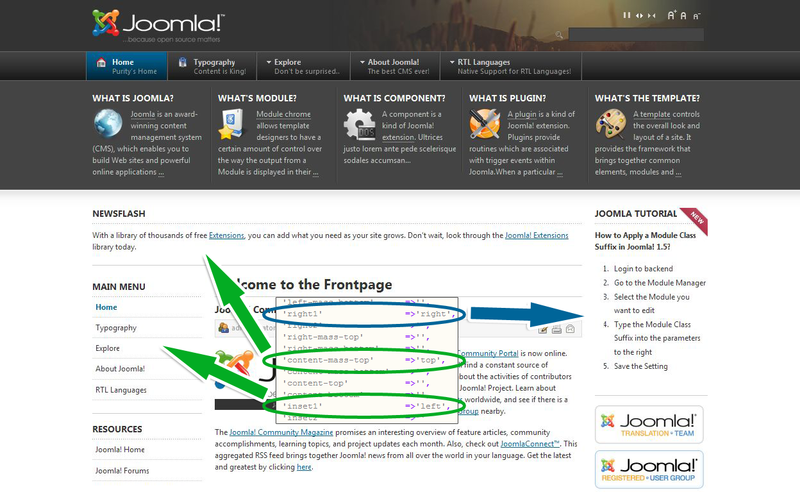 Please note that this documentation section only applies for T3 Framework based templates developed by JoomlArt. Third party developers have customized the template administration panel. Slogan - used for site slogan or short description. Allows you to select the menu to be used as the main navigation of the website. I will be used by the navigation system and usually the framework will use the mainmenu menu by default. Set here the Start and the End level for the menu to be rendered. Usually will start by default with the menu root, level 0 (zero) and will end with -1, meaning it will render all levels, no matter the menu deepness. To learn more about the menu system override features, please visit our designated documentation section. fade and slide - the default setting. If any of the animation types is enabled, you can set also the animation duration, the default is 200 mili-seconds. JA Purity II provides multiple layout and overrides features. Same as for the navigation system, you can set a default layout, and also a specific layout for a specific page or component. iphone - special layout designed for iPhone devices. The variations are built using different block configurations and styling, so if you want to learn more about these variations, feel free to visit this documentation here. This setting enables the layout overrides and works very similar as the menu system override. To learn more about the layouts override, please visit our documentation section here. exclude a specific module for using this capability, and the default value is 38, meaning that module with ID=38 will be excluded from using the collapsible capability.